Jangaran Nejad, A., Peyghan, R., Najafzadeh Varzi, H., Shahriyari, A. (2017). Florfenicol pharmacokinetics following intravenous and oral administrations and its elimination after oral and bath administrations in common carp (Cyprinus carpio). Veterinary Research Forum, 8(4), 327-331. Abdolhossein Jangaran Nejad; Rahim Peyghan; Hossein Najafzadeh Varzi; Ali Shahriyari. "Florfenicol pharmacokinetics following intravenous and oral administrations and its elimination after oral and bath administrations in common carp (Cyprinus carpio)". Veterinary Research Forum, 8, 4, 2017, 327-331. Jangaran Nejad, A., Peyghan, R., Najafzadeh Varzi, H., Shahriyari, A. (2017). 'Florfenicol pharmacokinetics following intravenous and oral administrations and its elimination after oral and bath administrations in common carp (Cyprinus carpio)', Veterinary Research Forum, 8(4), pp. 327-331. Jangaran Nejad, A., Peyghan, R., Najafzadeh Varzi, H., Shahriyari, A. Florfenicol pharmacokinetics following intravenous and oral administrations and its elimination after oral and bath administrations in common carp (Cyprinus carpio). 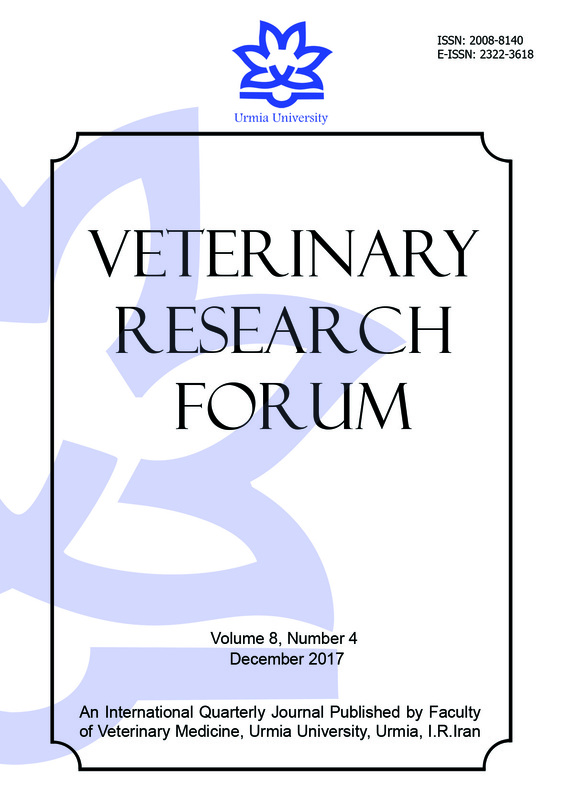 Veterinary Research Forum, 2017; 8(4): 327-331. The aim of this study was to evaluate pharmacokinetic profiles of florfenicol after a single dose of intravenous (5.00 mg kg-1 body weight) and oral (40.00 mg kg-1 body weight) administrations in common carp (Cyprinus carpio). The residue depletion of florfenicol was also investigated after oral administration (10.00 mg kg-1 body weight) and bath treatment (5.00 mg L-1) for 10 consecutive days. Pharmacokinetics of florfenicol in plasma after a single dose administration, at 10 time points (0.50, 1, 2, 4, 8, 12, 24, 72, 120 and 168 hr) and florfenicol concentrations in tissues (plasma, liver and muscle) at three time points (1, 7 and 14 days) after 10 consecutive days, were analyzed by high performance liquid chromatography. The peak concentration of florfenicol was 137.02 ng mL-1 and the time to reach peak concentration in plasma was two hr. The elimination half-lives, the volume of distribution at steady state and total body clearance were estimated as 21.40 hr, 0.30 and 0.03 L hr-1, respectively. After drug administration for 10 days, it's concentration in plasma and muscle in oral treatment was significantly more than bath treatment in all days. Drug concentrations in the liver after bath treatment were significantly higher for a shorter period than the concentration in the oral treatment, indicating that higher levels of florfenicol for a longer period can be achieved in the tissues after oral drug administration. According to pharmacokinetic results, florfenicol may be a suitable candidate for the treatment of common bacterial infections in common carp farming. Wang W, Dai X, Li Z, et al. Tissue distribution and elimination of florfenicol in top mouth culter (Culter alburnus) after oral administration. Czech J Food Sci 2009; 27(3): 316-221. Gaunt P, Endris R, Khoo L, et al. Preliminary assessment of the tolerance and efficacy of florfenicol against Edwardsiella ictaluri administered in feed to channel catfish. J Aquat Anim Health 2003; 15: 239-247. Martinsen B, Horsberg TE, Varma KJ, et al. Single dose pharmacokinetic study of florfenicol in Atlantic salmon (Salmo salar) in sea water at 11 ˚C. Aquaculture 1993; 112: 1-11. Horsberg TE, Hoff KA, Nordmo R. Pharmacokinetics of florfenicol and its metabolite florfenicol amine in Atlantic salmon. J Aquat Anim Health 1996; 8: 292-301. Park BK, Lim JH, Kim MS, et al. Pharmacokinetics offlorfenicol and its metabolite, florfenicol amine, in the Korean catfish (Silurus asotus). J Vet Pharmacol Ther 2006; 29(1): 37-40. Yanong RPE, Curtis EW. Pharmacokinetic studies of florfenicol in koi carp and three-spot gourami, Trichogaster tricopterus, after oral and intramuscular treatment. J Aquat Anim Health 2005; 17: 129-137. Samuelsen OB, Bergh O, Ervik A. Pharmacokinetics of florfenicol in cod, Gadis morhua, and in vitro antimicrobial activity against Vibrio anguillarum. Dis Aquat Organ 2003; 56: 127-133. Lewbart GA, Papich MG, Whitt-Smith D. Pharmacokinetics of florfenicol in the red pacu (Piaractus brachypomus) after single dose intramuscular administration. J Vet Pharmacol Ther 2005; 28: 317-319. Feng JB, Jia XP, Li LD. Tissue distribution and elimination of florfenicol in tilapia (Oreochromis niloticus × O. caureus) after a single oral administration in freshwater and seawater at 28 ‎°C. Aquaculture 2008; 276: 29-35. Feng JB, Jia XP. Single dose pharmacokinetic study of florfenicol in tilapia (Oreochromis niloticus × O. aureus) held in freshwater at 22 °C. Aquaculture 2009; 289: 129-133. Gaikowski MP, Mushtaq M, Cassidy P, et al. Depletion of florfenicol amine, marker residue of florfenicol, from the edible fillet of tilapia (Oreochromis niloticus × O. niloticus and O. niloticus × O. aureus) following florfenicol administration in feed. Aquaculture 2010; 301: 1-6. Sun YX, Zhao HY, Shan Q, et al. Tissue distribution and elimination of florfenicol in Crucian carp (Carassius auratus cuvieri) after a single dose intramuscular or oral administration. Aquaculture 2010; 309: 82-85. Lim JH, Kim MS, Hwang YH, et al. Plasma and tissue depletion of florfenicol in olive flounder (Paralichthys olivaceus) after oral administration. Aquaculture 2010; 307: 71-74. Gaunt PS, Langston C, Wrzesinski C, et al. Single intravenous and oral dose pharmacokinetics of florfenicol in the channel catfish (Ictalurus punctatus). J Vet Pharmacol Ther 2011; 35, 503-507. Yang Q, Xie L, Wu Z, et al. Pharmacokinetics of florfenicol after oral administration in yellow catfish, Pelteobagrus fulvidraco. J World Aquacult Soc 2013; 44(4): 586-592. Pourmolaie B, Eshraghi HR, Haghighi M, et al. Pharmacokinetics of florfenicol administrated to rainbow trout (Oncorhynchus mykiss) by oral gavages and medicated feed routes. Bull Env Pharmacol Life Sci 2015; 4(4): 14-17. Feng J, Jia X, Li L. High-performance liquid chromatographic determination of florfenicol in tilapia (Oreochromis niloticus × O. aureus). South China Fish Sci 2005; 1: 35-42. Horsberg TE, Martinsen B, Varma KJ. The disposition of 14C-florfenicol in Atlantic salmon (Salmo salar). Aquaculture 1994; 122: 97-106. Di Salvo A, della Rocca G, Terzetti E, et al. Florfenicol depletion in edible tissue of rainbow trout, Oncorhynchus mykiss (Walbaum), and sea bream, Sparus aurata L. J Fish Dis 2013; 36: 685-693. Bowser PR, Kosoff RE, Chen CY, et al. Felorfenicol residues in Nile tilapia after 10-d oral dosing in feed: Effect of fish size. J Aquat Anim Health 2009; 21(1): 14-17.